The normal word order in French and English is subject + verb, as in vous êtes – you are. Both languages also have what is known as inversion, where the verb and subject pronoun switch places, resulting in êtes-vous – are you. 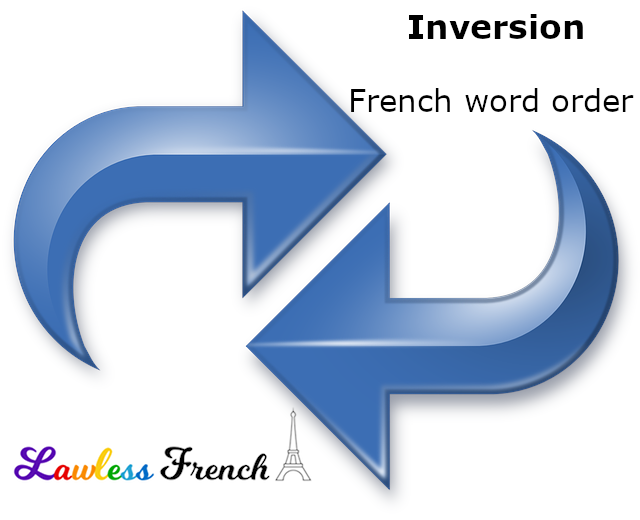 In English, inversion is used only to ask questions, but in French it has several different purposes. French inversion is most commonly used to ask questions. Êtes-vous prêt ? Are you ready? Sait-elle la réponse ? Does she know the answer? Inversion sets off verbs that report direct speech or comments. « Je sais, dit-elle, que tu as menti ». "I know," she said, "that you lied." Elle est partie, paraît-il. Apparently she left. Il y a un problème, me semble-t-il. There seems to be a problem. Informally, you can use que instead – see Informal pronouns, "Extra que." Several adverbs must be followed by inversion when they’re used at the beginning of a clause. À peine sommes-nous arrivés qu’il a téléphoné. We’d scarcely arrived when he called. Toujours est-il que vous devez l’essayer. Be that as it may, you need to try. Nevertheless, you need to try. The fact remains that you need to try. In a number of constructions, inversion is optional. After peut-être, sans doute, and the exclamative combien, you need either inversion or the word que. Peut-être que vous avez sommeil. Perhaps you’re tired. Sans doute qu’ils ont oublié. Of course they’ve forgotten. Combien d’argent avons-nous perdu ! Combien d’argent que nous avons perdu ! We lost so much money! After three adverbs, inversion is completely optional. Ainsi ils ont perdu. Thus they lost. En vain avons-nous crié au secours. En vain nous avons crié au secours. We shouted for help in vain. When inversion is optional, both choices are equally correct, but inversion is somewhat more formal. Just as liaisons are required between subject pronouns + verbs, they are required between inverted verbs + subject pronouns. Now that you understand inversion with pronouns, go on to part 2: Inversion with nouns. Can you add a section about how to do inversion with the negative, in present tense? My guess on the word order is “Pourquoi Marc n’a-t-il pas ses devoirs?” but I am not sure.